Shipping - Getting the food where it’s most needed! NGO's - Non Governmental Organizations who have worked closely with their governments to make sure the food is appropriately distributed, and actually reaches those most in need. Richard & Tim have over 40 years of shipping food, to over 70 different countries, in that time God has not allowed even one container to be lost. We believe this to be a miracle. 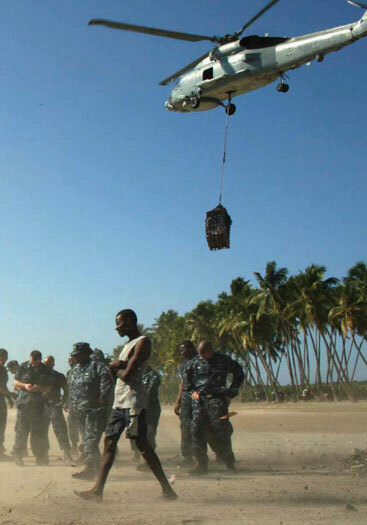 US military (Navy, Air Force, Marines, Army & Coast Guard) - Through a concerted effort with our military, we have seen many organizations packets of food reach the hurting from natural disasters like earthquakes, fire, flood and even areas where governments have collapsed. World wide organizations - World Vision, Operation Blessing, The Red Cross, Salvation Army, Somebody Cares, Intl, and hundreds of others have been integral in making sure all the organizations food we've worked with, reaches starving children. This teamwork will be an important part of our success in delivering millions of meals to many countries each year.